A typical PCS meeting scene. The Prescott Computer Society (PCS) is a PC-based users group located in Prescott, Arizona. Our primary attention is focused on IBM-compatible computers, associated software and smart phones. We strive to provide personal, home office and small business computing solutions and presentation topics. You may obtain both basic and advanced information about computers by attending our club's meetings. We hold several meetings each month to show you how to get the most out of your computer. These consist of our General meeting as well as several Special Interest Group meetings. Anyone with an interest in computers is welcome to attend our meetings and join PCS. 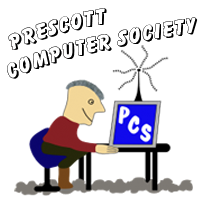 PCS is a member of the Association of Personal Computer User Groups (APCUG). Additional information about PCS is available at our About Us page. For information about becoming a member of PCS, please contact Murray Smolens, our Membership chair. A typical Q&A meeting chaired by some of our favorite PCS members. It's known as a "Stump The Geeks" session which is always enjoyed by all those who attend. 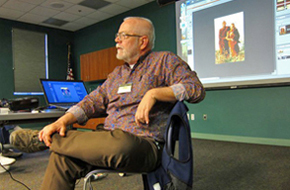 We often hold Question and Answer sessions at General meetings where our members attempt to "Stump The Geeks" with their questions about computer and smartphone problems and other related issues. Do the geeks ever get stumped? Of course, once in a while they do but we all appreciate the very interesting and informative discussions that are held. I guess you'll just have to come to a meeting to see for yourself. Unless otherwise noted, all meetings will be held in the Founders Suite (1st floor) of the Prescott Public Library. The Library is located at 215 E. Goodwin Street, Prescott, Arizona. Our extended meeting schedule (5-6 months in advance) is available here. The free Android app which conveniently displays the complete extended schedule for PCS on your Android smartphone or tablet can be obtained here. Don't miss out on any of our very interesting meetings because you forgot to check your calendar! Ask a technology question and get help from members of the Prescott Computer Society. Bring your own laptop or mobile device or use a library laptop. This is a weekly drop-in service and registration is not required. Murray will lead the Smartphone SIG discussion of best smartphones, thermostats and phone cameras plus Tips and Tricks in his presentation previously canceled due to the Great Blizzard of '19. Many aspects of digital photography will be discussed, including use of digital cameras and using Photoshop Elements to make your photos look their best. Ray Carlson continues his presentation on the future of computer security without passwords. This topic has evoked growing attention and development. This presentation will summarize such recent discussion identifying what ways of identifying yourself to your computer, tablet or phone other than passwords are viewed as the safest. Ray will demonstrate their use and the basic idea as to how they work including where and when they can be used. Questions and discussion will be encouraged including input from those who have tried these options. Second Hour: Phil Ball will present Tips and Tricks with insights into various topics that assist with regular computer activity. 1) We hold an informal Flea Market in which you are encouraged to bring in your excess computer equipment or software and make them available for others to enjoy at no charge. Please deposit give-away items on the table in the back marked "Free Stuff." Any items left here at the end of the meeting are subject to disposal. 2) If you have items that are just too good to give away, you may set up a separate table and hold your own sale. 3) We conduct a free drawing for gift cards at the end of the meeting, so make sure to get a pair of tickets from whoever is in charge and place one in the container provided. 4) We will also accept your used ink and toner cartridges for recycling. They are turned in to Think4Inc for credits which PCS uses to purchase office supplies from them. No PCS meeting is scheduled.